RIGGER RAMBLINGS: The Calgary Roughnecks are back at the Scotiabank Saddledome tonight for a Maritimes Kitchen Party against the Vancouver Warriors. Game time is 7:00 p.m. with $5 Rough House food and beverage specials, music and pub-style games beginning at 5:00 p.m. Roughnecks fans that arrive at the ‘Dome between 5:00-5:30 p.m. will receive a complimentary voucher for a beverage and a slice of pizza or a burger. Fans are encouraged to bring a pair of spoons and play along to the Maritimes tunes during a halftime performance by the Nova Scotiables. Calgary is coming off a bye-week. They last saw action on Jan. 20 when they fell to the Colorado Mammoth by a score of 12-7. The Mammoth’s Ryan Benesch (3g, 4a) tallied a game-leading seven-point effort for the home team while Ryan Martel led Calgary’s offence with four points. 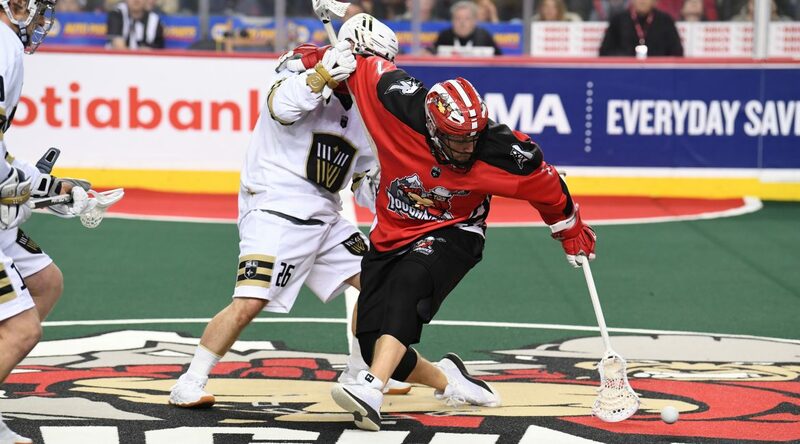 The Warriors are coming off last Saturday’s 11-10 overtime victory against the Mammoth. VANCOUVER: Tonight marks the third and final regular season match-up between the Roughnecks and Warriors. The series is split 1-1 as Vancouver took the opener in overtime by a score of 14-13 on Dec. 15 while on Dec. 21, Calgary brought down the Warriors 14-8 with a strong offensive push in the second half. Calgary is 1-2 when playing at the ’Dome this season while Vancouver is 1-2 on the road. Dec. 15/18 at CGY: VAN 14 CGY 13 OT… Matt Beers scored 4:17 into overtime to push Vancouver past Calgary. Dec. 21/18 at VAN: CGY 14 VAN 8… Roughnecks score eight second half goals en route to a 14-8 victory. ROUGHNECKS MONTH-BY-MONTH: December (2-1), January (1-3). ROUGHNECKS VS.: (BUF 0-0), (COL 1-1), (GA 0-0), (NE 0-1), (PHI 0-0), (ROC 0-0), (SD 1-1), (SAS 0-0), (TOR 0-0), (VAN 1-1). ROOKIE SPOTLIGHT: Defenceman Eli Salama recorded his first NLL point with an assist in Calgary’s victory against the Vancouver Warriors on Dec. 21. The 22-year-old has tallied three assists in five games after being drafted by the Roughencks in the first round, 12th overall, in the 2018 NLL Entry Draft. Salama spent the 2018 season with the Langley Thunder of the WLA. He recorded seven points (3g, 4a) in 15 games. SPECIAL TEAMS WATCH: Calgary’s power play is eighth in the NLL at 39.47% while the penalty kill is second in the league at 61.11%. ROUGHNECKS VS. DIVISION: West (3-3), East (0-1). QUARTER BREAK: The Roughnecks have outscored their opposition in 12 quarters this season while also tying their opponents in three. Of the 28 quarters played, 10 have resulted in a one-goal differential while 12 saw a spread of two or more goals. DID YOU KNOW? : Alternate captain Dane Dobbie is tied for third in the league for goals with 17 and tied for fourth in points with 37. Last season the forward became the franchise’s all-time leading scorer finishing the season with 751 points (371g, 380a) in 160 contests to surpass the previous mark of 684 set by now-Rush forward Jeff Shattler. Dobbie is also creeping up on Shattler’s franchise record of 416 assists; he currently has 400 helpers in 167 career games. LADYCROSSE IS BACK: The Calgary Roughnecks are proud to present Ladycrosse tomorrow at the Scotiabank Saddledome. Women aged 18 and over are invited to join us for a fun-filled morning learning directly from the Roughnecks players and coaches on the ‘Dome turf. The Roughnecks will be teaching basic lacrosse drills, training routines, and rules of the game. Afterwards, all ladies are invited to mix & mingle with the players and coaches while enjoying a brunch buffet served in the Chrysler Club. Ladycrosse registration along with full event details can be found at CalgaryRoughnecks.com/ladycrosse. MILESTONE MARKERS: On Jan. 20, multiple players hit milestones: Dane Dobbie recorded his 400th career assist while Mitch Wilde recorded his 50th career helper and Riley Loewen eclipsed 200 loose balls. On Jan. 18, Tyson Bell picked up nine loose balls to eclipse 300. On Jan. 12, Tyler Burton and Greg Harnett both played their 100th NLL career game while rookie Reece Callies recorded his first NLL goal on the same night. On Jan. 6, first round draft pick in 2018 Shane Simpson tallied his first NLL career point with a goal and two assists while Chad Cummings eclipsed 150 loose balls. On Dec. 28, Dan Taylor eclipsed 50 NLL career points while rookie Reece Callies recorded his first NLL career point with an assist. On Dec. 21, Rhys Duch surpassed 900 NLL career points and rookie Eli Salama recorded his first NLL career point with an assist. On Dec. 15, Dan MacRae eclipsed 600 loose balls while Chris Boushy recorded his first NLL goal and assist on the same night. POST-GAME AUTOGRAPHS: Due to a special Season Ticket Holder Turf Party, there will be no post-game autographs after tonight’s game. THE ROAD AHEAD: The Roughnecks now begin their longest road stretch of the season including a bye-week in Week 11. The road stint will see the Riggers visit the Saskatchew Rush on Feb. 9 and Mar. 2 and the Buffalo Bandits on Feb. 16. Their next home game will be Mar. 9 when they host the Toronto Rock at the Scotiabank Saddledome at 7:00 p.m.